is made by combining water, sand, and cement. It is very much like plaster that one would expect to find in the construction of indoor walls. It is a very durable and very waterproof material, but it does allow water vapor to permeate its surface. Many Stucco Sidings have an acrylic coating to protect against this. Stucco is put up by stretching a wire mesh between the studs of a wall, with the stucco still in liquid form being applied in two or three coats. The final coat afterwards is smoothed out and made even. 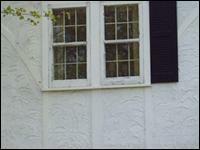 Stucco is, however, susceptible to cracks. Cracks can be repaired by cleaning the area around the crack and applying caulk. Be sure to use paintable caulk and match your paint to the color of the stucco.